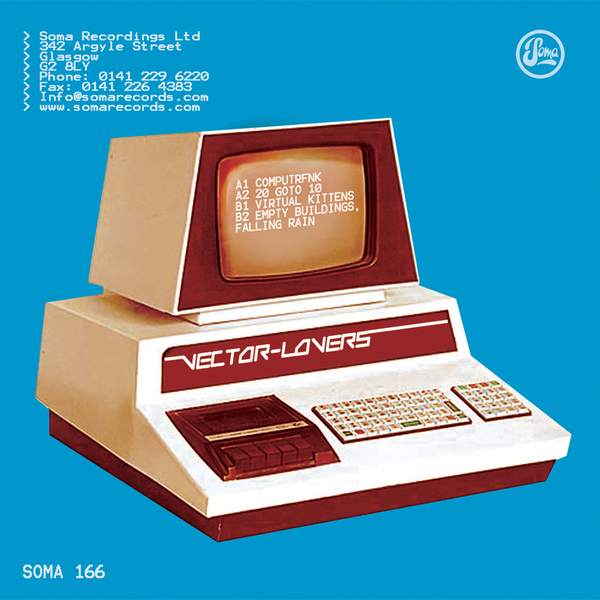 After the success of last year's eponymous debut album, Vector Lovers (aka Martin Wheeler) delivers a roasting hotpot of refried, electro-funk through the 'Computrfnk' EP. All exclusives, the four tracks on show take an IDM set of production sensibilities then apply them to some undulating, slow burning fortified house marbled throughout by a piquant sense of precision. Opening with 'Computrfnk', Wheeler applies his epigrammatic ardour to a set of grade-A electro-funk beats and vocals that build gradually like digital sediment, slowly burying you beneath. Elsewhere 'Virtual Kittens' deals up a full hand of dogged pulsing electro bass and, along with ricocheting beats, introduces a set of frosted glass melodies reminiscent of skewed turquoise fetishists Boards of Canada whilst 'Empty Buildings, Falling Rain...' ping-pongs crisp electronica and haunted house atmospherics into a match winning formation that will be pleasingly familiar to aficionados of deep electronics. When Vector Lovers free themselves from the 8-bit presets and start jacking the House in a techno stylee - for our money the formula's much much better. Good sh*t.